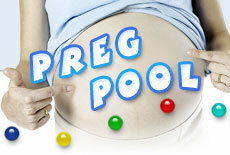 Preg Pool: Free Online Guessing Pool. mom-to-be? Then start a preg pool! 3. Send an invitation to your friends and family and start playing!